If brown rice is better for you than white rice, and brown bread is better than white bread, then it correlates that brown eggs are better than white eggs, right? 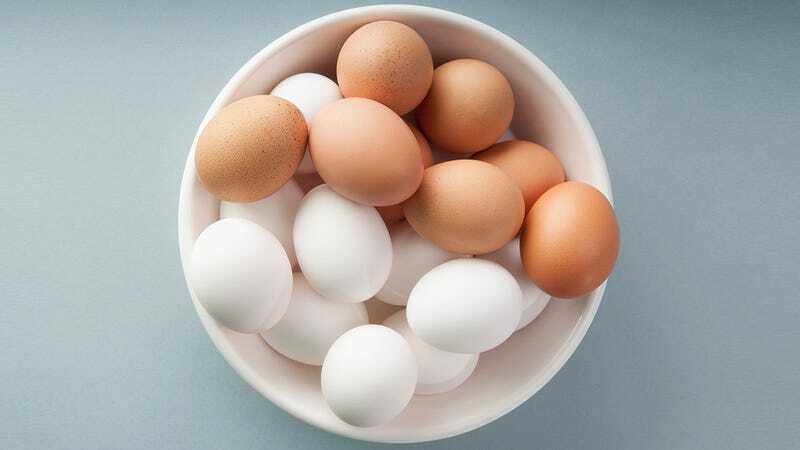 A hen’s breed determines the shell color of the eggs it lays, which can range from perfect white to cream to brown to olive and even blue. A fun chicken rule of thumb: You can generally determine the color of the egg a hen will lay by looking at its earlobes. White earlobes mean white eggs; brown or red earlobes mean brown eggs; etc. That’s it. It’s all aesthetics: There’s no health or flavor difference based on the eggshell’s color. “Nutritionally they’re the same and taste is usually the same unless certain hens are given a different diet or feed,” says Katie Nola, director of consumer affairs for the Iowa Egg Council. If consumers actually want to know more about the nutrients in their eggs, they’ll have to look at more than just its shell, says Rachel Khong, a former editor at Lucky Peach and author of the book All About Eggs. But one can’t just look at an eggs color and know how its hen was farmed. So why are brown and white eggs even labelled separately?